I too, LURVE this image! So cute and I love her colors! Thanks so much for joining us this week at Stamptacular Sunday! ♥ Good luck on our "Stars & Stripes" challenge! Wow, stunning, stunning, stunning. Love the whole card. The button and how you finished it is fabulous. Thanks for sharing it with us at SSC. Such a sweet card Anita! I love the big scallops on your card and the striped background! Thanks for joining us at the Tiddly Inks challenge this week. So adorable! Thanks for playing along with the Cupcake Inspiration Challenge! I love how crisp, clean and CUTE this card is!!! Great Job! This is gorgeous Anita! Love how you combined all the red, blue and white! 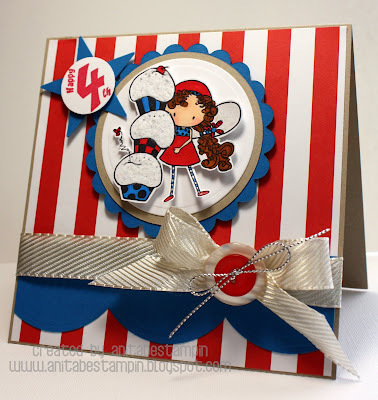 what a darling card.,..my first thought was a circus card with the big red stripes....but I love the image you used and how you added the big blue scallops....awesom card!!! Congrats!!! !